Well, how should I start? 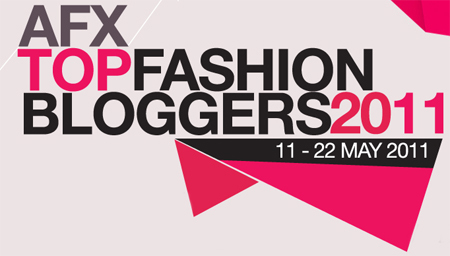 LOL, see the news about AFX fashion blogger competition this MORNING and i've got myself like this ----> :D :D :D ME aka Major Exciting, although there are many Indonesian bloggers are more popular than me, there is no harm in trying and dreaming. In office hours and this AFX is all I'm thinking off, but TGIF *thanks GOD is Friday* and i have my work done after i have my lunch, well done? ask my manager about that, hahahaha, OK ENOUGH about me, let's start what should and i will gonna do now!!! and today is a last day, but at least you still have time to register and participate. This year is their second time, after in 2010 successful to hold this event. will take place from 13-22 May 2011, there will be four AFX series of events in this time, namely the Audi Fashion Festival, Star Creation, Blueprint, and Fashion Asia Summit. Opening by Missoni and Closing by Ungaro *DYING*, but hold on, who is willing to miss Vera Wang and Prabal Gurung as Asian fashion heroes, Raoul and Alldreesedup will also take part in this series. Some Are Thieves, Danjyo + Hiyoji, Geulis, Isis, KLE, Monday to Sunday, STAB, Kaligula, Seba Shoes dan Soe Hoe. And of course international cruise collection. Fashion Confference, who will and should be there? 1. I was an extraordinary exhibisionist fame-hungry (˘ﻬ˘), but unfortunately what I was doing in the last 22 years is ending grief, there are nobodies know me. haha im kidding, im only 22 years old this year and creating fashion as my life six months ago after i decided to quit from one of world multinational oil services company. 4. And for the sake of fashion pope Anna Wintour, my blog was 6 months old plus 7 days, and for your consideration this is a sign from the almighty, hehehe ok don't take seriously, i love fashion and writing, so this blog is created. 5. Is always be my fantasy to attended fashion week with my own outfits, head to toe, you know what i mean, Jakarta with the weather and the spot sometime not support me to dressed up like what should i dress up. That's mean i still kept some fashion items in my wardrobe hahahaha, wait for right moment to wear them. 6. Love to see new fashion people and "battle look" with them, like people say, "you can buy fashion, but not with style, style is a gift"
7. Are you already sure would choose me? hahahaha, what i have to say, i love this competition and i love you hehehe and have my physical and spiritual health :), trust me. 8. Hmmm maybe about 6 months this blog exists, my most visiting readers coming from US, beside Indonesia of course, its give me a chance to show what Asia had. 9. And if you choose me, i think in my mind that i will wear some of local designers creation, jakcet, shoes something mix with Italian, Parisian, Japanese, everything, hahahaha of course i have to show what Indonesia had. cihuy cihuy cihuy! se ma ngaaat! Good luck - I love your posts! Almost died myself when i read - PRABAL GURUNG. Is he gonna be there? OMG!!! I hope you win this and i am sure you will, i hope you post pictures and, AND dont forget if you come face-to-face with Mr. Prabal Gurung, can you have a picture taken with a note that say I LOVE PATTIETA? hahaha that's too much to ask i know but i do pray that you'll get this. Good luck & great blog!!! astaga, kenapa harus ulat bulu sih, kakak? (=___=) geli deh ah. but I support you a lot!!!! as your blogger junior (haiah), I should to support you!! and moga-moga saya ketularan juga ke Singapore, ke Thailand, dan ke UK setelah mensupport kakak. amiiin *dikeplak*. Hope you win it! then see you there!